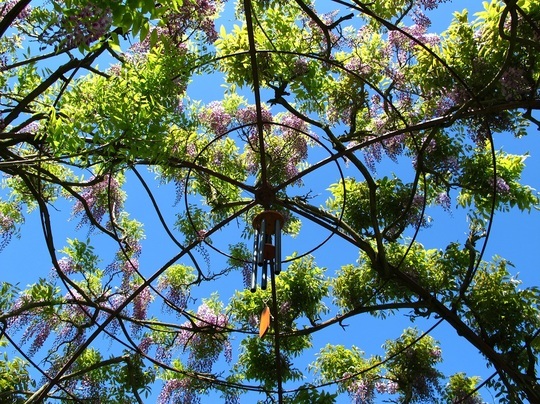 Looking up into the domed structure covered with wisteria, I thought it was a beautiful way to show off the plant, underneath was a curved seating area which looked along a mowed path into the meadow! Thats an unusual shot, and lovely too. Isn't that a great idea! We've been working out what sort of framework to put up outside the summerhouse so that a very eager wisteria can get a grip and give some scented shade in future years. Now how to replicate this.....? With the sky that blue it was lovely to look up, wasn't sure if you could see the idea well enough though, I have a picture looking towards it if that helps? This was in an amazing garden and rather nice house (I don't think you can go in it). The structure here is metal. I'm not sure much else would be strong enough? Thank you Karen, Paul, Cinderella, gattina and Mark. thanks kasy, pixi and surreylad, i just love blue and green, most of my photos are blue and green!!!! they always used to say 'blue and green should never be seen' but i disagree!!! admittedly it has to be the right blue and green but i just love them together!! maybe that explains my contrary nature!! I bet it was, lucky you. That's a lovely photo, Sticki. I always love looking up at a blue sky through green leaves - just magic! wouldnt mind it in my garden [with the permanent blue sky of course] would you clarice? too big for mine too but i can always dream!! "Red and Green Should Not Be Seen" and "Blue and Green Should Never Be Seen Without Something in Between"
but everyone who was commenting on it liked the colours together ~ they were designers!! i couldnt quite believe my eyes when i saw it, lots of wishing!!! That's a fabulous photo - you really are good! thanks tuesday but its the plants, the frame and the sky not me! Was you flat on your back when you took it, hic *#! Lol. er no!!! i was sitting very properly on the seat provided!! after that i went to the cafe/restaurant and had moroccan mint tea!!! Maybe you should go for a Wisteria Sticki - it'd seek out the light. good point meanie ~ there was a dying one by the front door when we moved in, i gave up in the end and took it out!! something that climbs then meanie??? thanks lulu, how was your time away? Lovely thanks. Come back to a whole garden in bloom! Sticki - your photos are always lovely - I really look forward to them!! oh, thank you melchi!! you are very kind, i take far too many pictures, clog up my computer and never get round to sorting them out!! occasionally one of them works out ok.
Thanx to visiting my photos. thank you esmael, looking forward to more of your photos. it was a lovely scene driad ~ i only had to look up and click!!! I love this colour of Wisteria. I have a pink one outside my back door and it is the highlight of my year when it flowers. This is a really nice way to show it. Sounds lovely Linda, I dont have a wisteria but I certainly enjoyed looking at this one. This photo was taken at Wyken Vineyard Gardens .